410 years ago a Muslim tried to kill a king and parliament. Sorry, wrong religious bogeyman. Then it was the Catholics that were persecuted for their faith in this country. With that religious persecution a small group decided one night to kill the, protestant, King and put a catholic one on the throne in his place. We all know how that went. Not that well. Ever since then we have celebrated the failure of this terrorist plot using the same materials that the plotters used to try and change history. Gunpowder. This time in rockets and other fireworks and not about a metric ton in barrels under the Great Hall in Westminster. 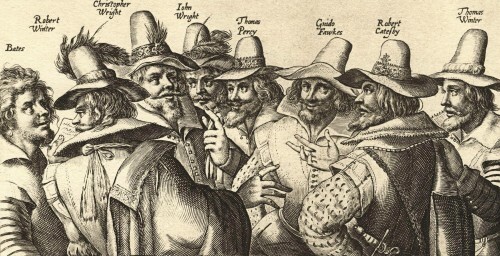 Guy Fawkes, or John Johnson, is the best known of the plotters. He was only brought on board because of his experience with explosives from his time fighting for Spain against the Netherlands. this was by the mastermind of the plot, Robert Catesby. This is the person who we should be burning on the top of the bonfire not Fawkes. A lot is known, and as been repeated at this time of year so I won’t mention that apart form something that I wasn’t aware of whist doing the minimal research for this piece – checking names & other small facts from Wikipedia. One thing I will mention is an Act of Parliament from January 1605/06 that I stumbled upon in this phase. The Act is called “Observance of 5th November Act 1605” [ Repealed in 1859 by the Anniversary Days Observance Act ]. It called for a public, annual, celebration of the failure of the plot and the protection of the King, and Parliament. Forasmuch as almighty God hath in all ages showed his power and mercy in the miraculous and gracious deliverance of his church, and in the protection of religious kings and states, and that no nation of the earth hath been blessed with greater benefit than this kingdom now enjoyeth, having the same true and free profession of the gospel under our most gracious sovereign lord King James, the most great learned and religious king that ever reigned therein, enriched with a most helpful and plentiful progeny proceeding out of his royal loins promising continuance of this happiness and profession to all posterity: the which many malignant and devilish papists, Jesuits, and seminary priests much envying and fearing, conspired most horribly, when the king’s most excellent majesty, the queen, the prince, and the lords spiritual and temporal, and commons, should have been assembled in the upper house of Parliament upon the fifth day of November in the year of our lord 1605 suddenly to have blown up the said house with gunpowder, an invention so inhuman, barbarous and cruel, as the like was never before heard of. This Act started the tradition of Guy Fawkes Night, or Gunpowder Treason Day as it was called in the 17th Century, that continue to this day. The Kid will have another King trailer!